Yay! It's Friday - and this Friday is a real Friday for me. By that, I mean I'm actually planning on taking the entire long weekend off! No working! I say planning because I have one of those brains that is on the go all the time. I don't know how to relax, but I'm currently reading a brilliant book (which you'll see below!) so hopefully that will give me some me time - and I have a bit of baking planned too! This week I've had a terribly sore throat and haven't been feeling very good, so I was so relieved to finally find a soup that I could eat with all of my food intolerances! 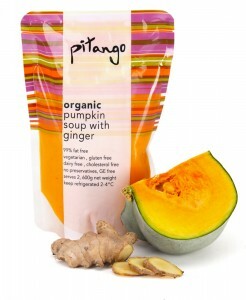 This Pitango Pumpkin Soup with Ginger was heaven sent this week! I'd be happy with a fridge full of soup. (I've already bought two more because I'm kind of sort of in love). I'm currently in the middle of this book and I am loving it. It has me giggling, gasping and wanting more. The book is about three Australian triplets who find themselves in the middle of dramatic moments. I don't want to say anymore because I don't want to give anything away - but this book has it all! It's a must read for sure. As if this cutie doesn't make you want to snuggle her! I loveeee puppy noses! I love this outfit - the colours are lovely! I'm a huge scarf fan so this is perfect! As always, I'm loving my little miss Chanel. She always manages to make me smile and is the most lovable little thing you'll ever meet. She's currently on the floor fast asleep after our walk (previously she was panting as above). and are you able to switch off easily - or are you always on the go like me?